Jarman Island Lighthouse | Lighthouses of Australia Inc.
Up until now this was one of the most endangered lighthouses in Australia. In regards to the question being posed ‘what does the community want’, the local mining industry and Council have responded with moves that will hopefully lead to the long term preservation of this light. The Jarman Island Lighthouse is one of two segmented cast iron sea lights in Western Australia using the newly developed pre-fabricated cast iron towers imported from England. 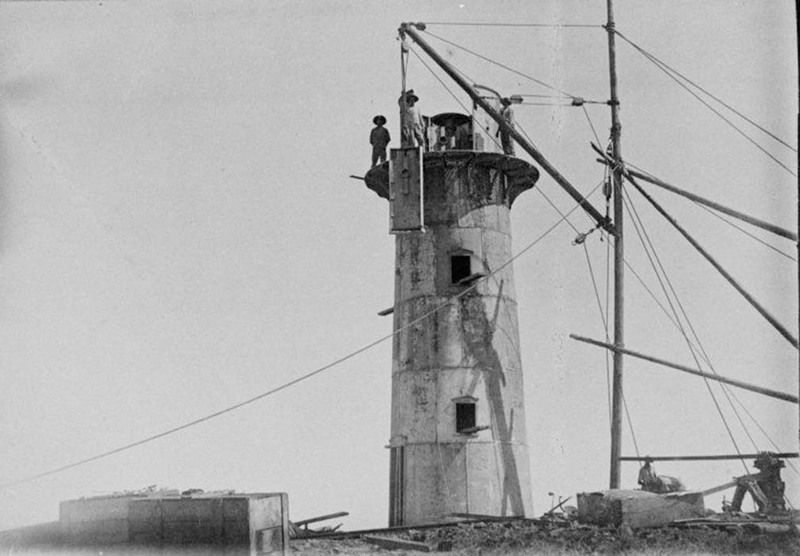 The other cast iron lighthouse, manufactured by Chance Brothers, is located at Point Moore near Geraldton. Cast iron towers were established as a viable way of getting lights to remote areas. The new design technique was innovative and represented a new era in lighthouse construction. As they were pre-fabricated, they could be constructed in remote areas with much more ease than one of stone. The lighthouse industry had reached the point in 1887 where a complete lighthouse could be packed and shipped from England for erection in Australia. The lighthouse at Jarman was complete except for the lens which seems to have been sent separately. The tower body of the Jarman Island lighthouse is composed of cast iron plated a little more than 1in (28mm) thick, flanged and bolted on the inside presenting a smooth face to the exterior. This type of construction was developed so that salt laden aerosols or spray would not get a foothold and cause corrosion at the joints. The lighthouse came complete from England with the tools for its construction and the paint to protect it. 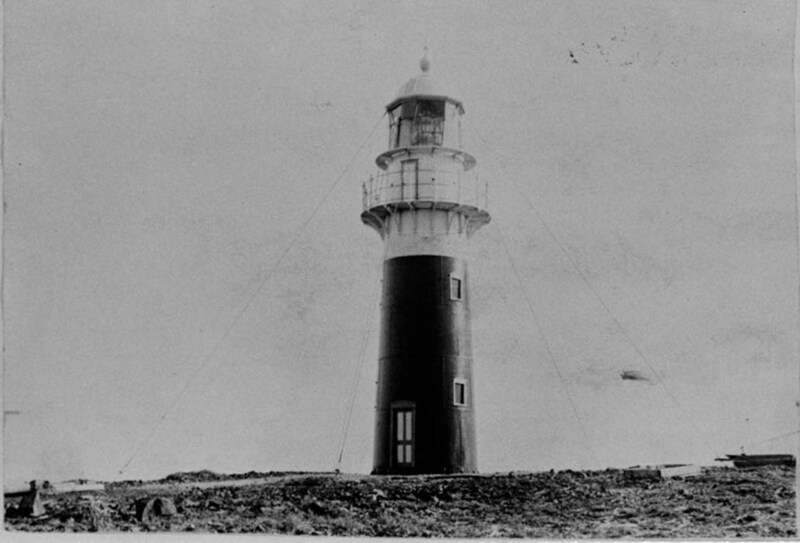 The Resident Engineer for the North West, W L Owen and Chief Government Architect George Temple Poole were responsible for the design and construction of the new lightstation. The labour for the construction were prisoners from Malaysia, the Philippines, China and Arabian countries, the majority of which were from the pearling fleet which was at that time laid up in Cossack during the cyclone season. The rubble and concrete duplex keepers quarters were also erected in 1888 and is typical of other buildings around Roebourne of that era. Pre-cast concrete blocks were used for corners, doors and windows. The unique feature of the 1888 dwelling is the curved concrete shell roof. Unfortunately this did not suit the climate and in along with additions in 1895 the whole structure was given a new roof and a verandah all around. The original light was a flashing second order lantern with a four wick Douglas burner. The fuel was kerosene or paraffin oil. The lamp was replaced in 1910 by a 55mm incandescent lamp using a vaporised kerosene mantle. The character then became occulting. In 1917, the lamp was to an AGA acetylene gas lamp activated by a sunvalve. The lighthouse, a prominent landmark feature, is synonymous with Jarman Island, Point Samson and Cossack. The area was first visited by Captain Jarman of the barque ‘Tien Tsin’. The Island took Jarman’s name and the township originally his ship’s name. Jarman Island marks the entry to the old abandoned Port of Cossack and the wharves at Point Samson. The port was established to service the pastoral leases that were opening up in the north west and the pearling luggers. The life of the port was short due to the silting up of the tidal estuary and by 1902 it was apparent that Cossack could no longer function as a viable port. By 1904 a new jetty had been built at Point Samson which then gradually replaced Cossack as a port. Later the facilities at Cape Lambert (Port Walcott) took over in the 1960s for overseas iron ore carriers. Between 1922 and 1941, the island was leased to J&T Muramats who are said to have used the place for holidays. In the 1950s the quarters and adjacent buildings were stripped of useful material and abandoned. The lighthouse was turned of for the last time in 1985 when the Cape Lambert lighthouse became operational. The size of the island is approximately 16ha. The lighthouse is painted red and white. Steel ladders and landings provide internal access to the lantern room. The tower was guyed with wire ropes at some point in the past but these are not now considered structurally necessary. The lighthouse is basically sound except for broken window glass and damaged panes to the lantern which allow the entry of water. There are areas of particular concern including the rusting of the interface between the lantern head and the roof and the corrosion of some of the holding down bolts. It was also noted at the time of inspection that the plywood blinds to the lantern are in need of painting. The condition of the remaining concrete roof of the duplex Keepers’ Quarters indicates that serious repair will be needed shortly if it is to be retained. The walls remain generally in good repair despite their exposure. The condition of the plaster to the 1888 building is very bad, the result of a poor mortar mix or cement. This render will continue to disintegrate rapidly and it may not be physically possible to save the remainder without considerable cost and effort. Despite the apparent ruined condition of the quarters, there is cause for optimism in that the basic structure is intact and salvageable if this is what is wanted. 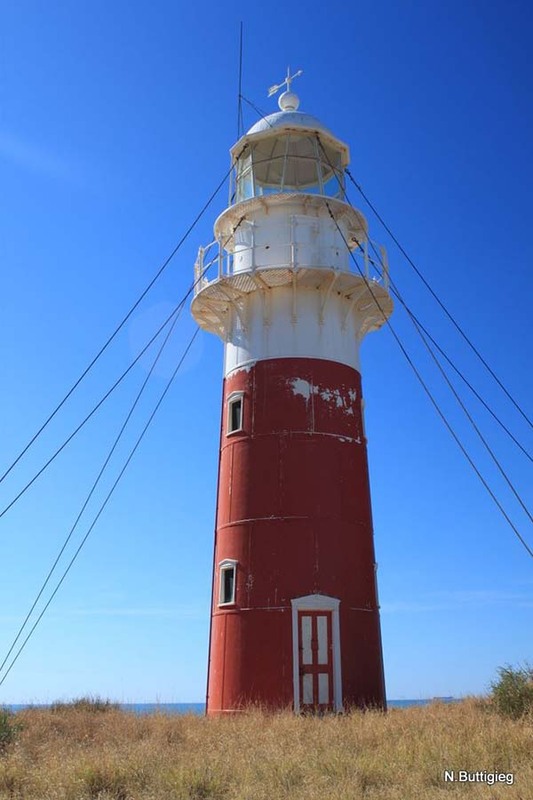 Robe River Iron Associated has recently funded and carried out an engineering study to determine the stability of Jarman Island lighthouse and keepers quarters. This restoration is overseen by the Heritage Council of WA, which has recently handed the responsibility for Cossack over to the Roebourne Shire. The Shire of Roebourne now has a 21 year lease of the island. See Conservation Plans for Jarman Island (Bulletin June 03) for more details. The first lightkeeper S Efford was appointed on 16 May 1888 with assistant lightkeeper W White not being appointed until 24 July 1888. Francis T Langer must have been an alien as apparently he was arrested and interned for the remainder of the First World War. Having a position of a keeper would have seemed to be an obvious threat by Authorities. Please note, this list is far from complete – we are aware that there may be omissions. If you have a reasonable belief that a keeper should be added to the list please forward it with all you know so we can validate the information and add them to the list. Please include this lighthouse’s name, the keepers full name, what years they were keepers and their position. Also include the same information for any other lights they were on then send it to Web Keeper.